Yesterday the Dow Jones Industrial Plummeted 1032 points as reported by CNBC. You can read more about the whole situation below. Dropping more than 1000 points is not a small matter. It could mean a loss of billions of dollars in investors portfolio. Which is why it is important for us to learn why the drop happened. In this article we will examine why Dow Jones suffered a massive 1000 point drop yesterday. I alerted my friends in the US Market Trading Telegram Group about the potential danger in the main indices. We were able to spot the weakness in the indices early and avoided the bearish situation. 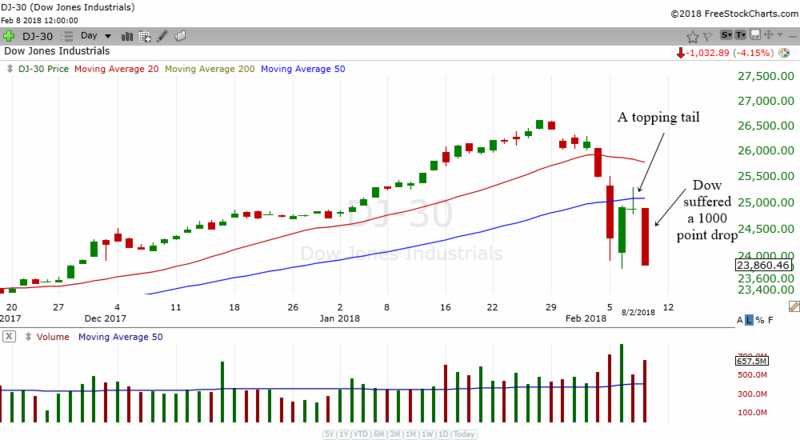 Here I will reveal to you how I spotted the danger and how you can also do the same the next time it happens.When you study why Dow plummeted, you will also be able to avoid this kind of drop in other financial instruments or stock. After all, before they collapse, they often give us the same hints and warning signs. The chart above shows the daily chart of the Dow Jones Industrial Average. Notice the big red bar that formed yesterday? That is what a 1000 point drop looks like. It is a fierce and angry looking red bar. Just like the color of an Angry Bird. I think you know what angry birds do. In the game, they fly through the air and knock down structures bringing it down. In the same way, a big red bar causes and investors portfolio to come down like a building that collapses. For many months, the Dow Jones has been going up steadily in an uptrend. The recent sell off and volatility has not been seen for a very long time. For those who are new to the stock market and have not experienced a bear market, this can be a shocking experience. Let us take a look at the warning signs that hinted to a 1000 point drop in Dow. I believe that the topping tail is one of the most potent reversal signals that you can get in a stock chart. It is easy to spot because visually it is very easy to see. When you see a topping tail appear in an index or stock, it is a big warning sign that the stock might collapse the next day. I have shown you the daily chart of the Dow Jones above. You can see that prior to the 1000 point drop, the Dow Jones had a topping tail candlestick pattern. This was a warning to traders that Dow might go down the next day. I usually like to use the futures chart to analyze the main indices but I find it useful to look at end of day charts of the Dow, S&P 500 and the Nasdaq. You can also use the indices' etf to analyze the stock market. I use the DIA, SPY and QQQ quite often. 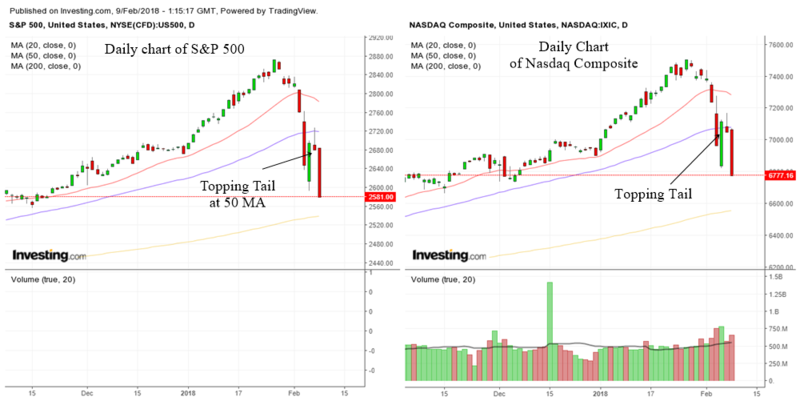 The image above shows the daily chart of the S&P 500 on the left and the daily chart of the Nasdaq Composite Index on the right. You can see both of them formed a topping tail before the massive sell off yesterday. The S&P actually bounced up to the 50 MA and formed a topping tail there. As you might already know, the 50 MA can act as a powerful support. Once broken, it can also act as a powerful resistance which keep a stock or index from rising. So, a topping tail plus the 50 MA can act as a powerful psychological bearish signal to traders. An experienced trader will study many different charts in the stock market. Not only that, they will also look at the different time frames of an index or stock. That is because he or she understands the importance of using multiple time frame analysis to know what is happening in the big picture and small picture. If you only look at the daily chart then you are at a disadvantage to many other traders and investors. Important turning point and events can often be spotted by using the smaller time frame. Sometimes, when I do an analysis and have written it out and published it, I change my mind. Of course I do not have the luxury of time to update every single analysis I do for my readers. The reason why I change my mind is because of what is happening in the smaller time frames. You should also learn to look at the smaller time frames because nobody will really care that much for your portfolio but only yourself. 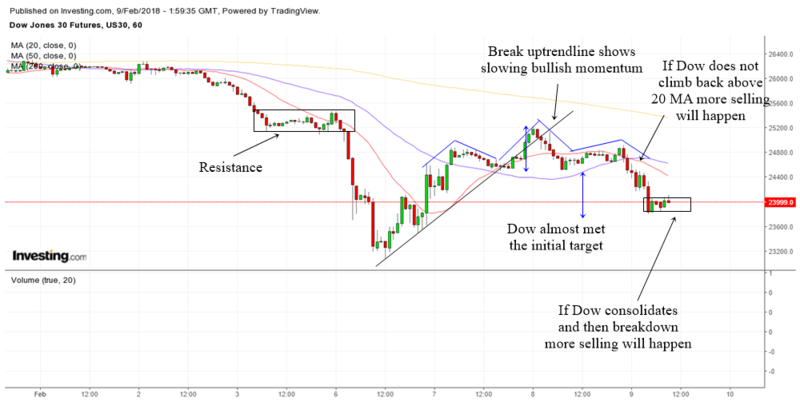 The chart above shows the 60 min chart of the Dow Futures. Notice the head and shoulders pattern that I have drawn in blue color? There are a few technical analysis lessons that I want to highlight to you here besides the head and shoulders pattern. So far, we can consider Dow to have met its initial target. If Dow continues to consolidate and then break down, you can expect more selling to happen. Take note of the words that I have underlined in bold, these are some clues that will happen in stocks or indices that are about to collapse. If you are interested to avoid massive losses in your account and sell before a stock collapses, do invest some time to read the above article. Trust me, it will save you a ton of money. There will come a time in your trading or investing career where you realize you need a system and not rely on your own wisdom or intelligence. Even if you are the most clever person in the room, the stock market can really mess with your emotions. By the end of the day, the emotion of fear and greed will rule your heart. A $500k loss in a single week will really upset most people. That is why the stock market can often take the starch out of you. If you cannot trust your emotions you need something more solid to guide you. Experienced traders who last a long time in the markets tend to have a solid system that guides them. The system will show them when they should buy and when they should avoid buying stocks. 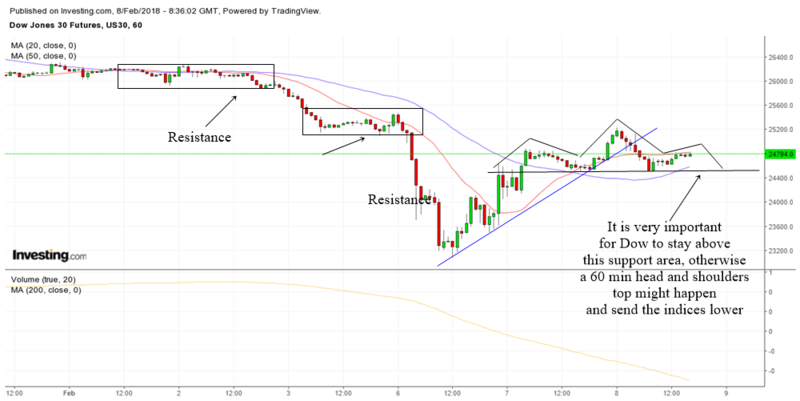 For me, I have found the 5 min 50 MA to be very useful. You can use any settings you want or any indicators. As long as it works and you are comfortable with it, then you will be fine. The chart above shows my personal system that I have created to help me and (hopefully you in the future) to know when it is conducive to buy stocks and when it is not conducive to buy stocks. When the 5 min chart is in the red zone, one should avoid buying stocks. You should even short it. Which is what I did yesterday when I shorted the market. 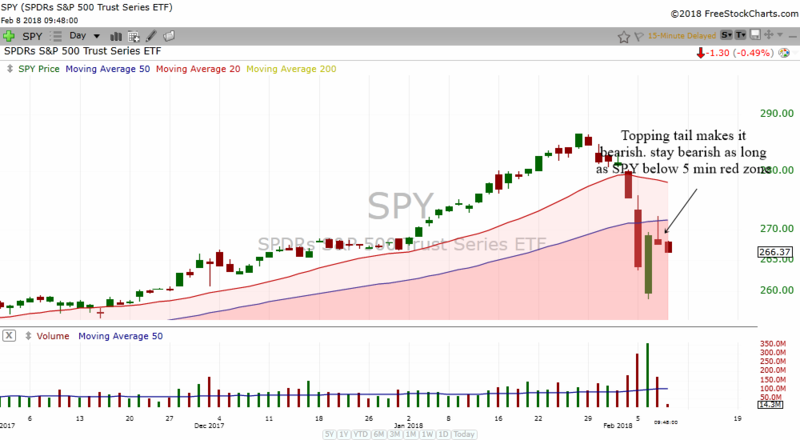 Notice how the SPY turned bullish when it went back into the white zone? Notice how it turned bearish again when it drop into the red zone? 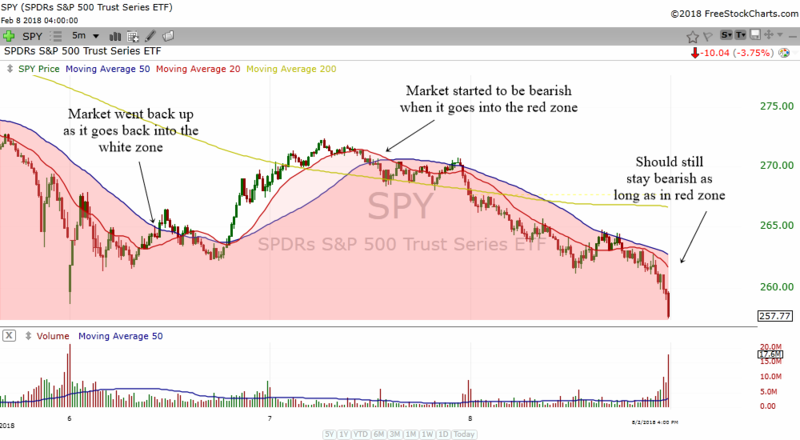 At this moment, one should still stay bearish on the markets as long as SPY is in the red zone. If you are wondering how I came up with the red zone/white zone thing, it is actually pretty easy. Anything below the 5 min 50 MA is the red zone. I just used my charting software to color the whole area below the 5 min 50 MA red so that I can easily see when I should buy stocks and when I should avoid or short them. It works like a traffic light. Red means no go. Just in case you think I'm writing all this in hindsight, I would like to show you what I put in my Telegram group yesterday. I enjoy doing all these analysis and I think if you have something of value, you should share it with others. The above is the chart of Dow Futures I shared. 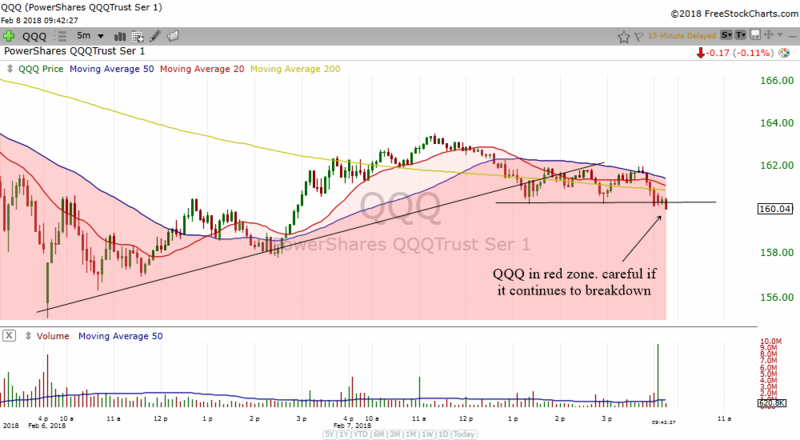 This is the 5 min chart of QQQ with the red zone white zone. QQQ was in a red zone. It broke an uptrend line and was about to break down lower. This is where I spotted the topping tail and warned my friends to stay bearish till the trend changes in the 5 min chart of SPY. Did I know that the Dow Jones will drop 1000 points yesterday? Well, of course not. Nobody really knows how much or where or when the markets will go to or drop to. But from experience and using a set of reliable tools, we can often anticipate what might happen and take the necessary steps. Either to avoid a crash or to buy a stock or to sell a stock.